H.R.H. Prince Khalifa bin Salman Al Khalifa, Prime Minister nominated H.E. 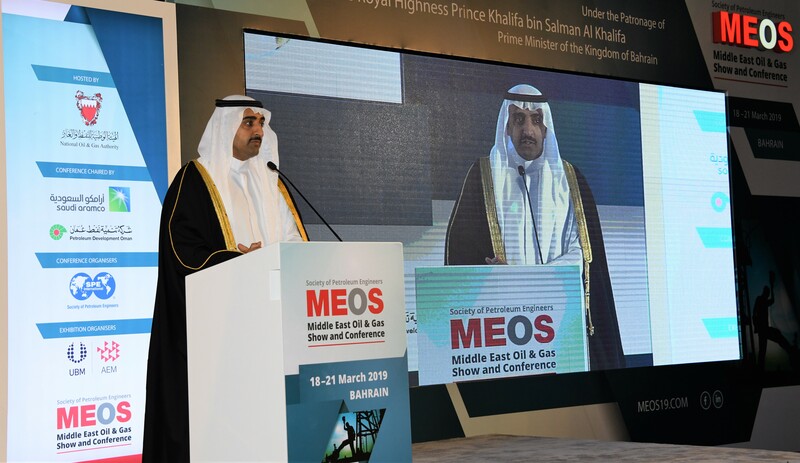 Shaikh Khalid bin Abdullah Al Khalifa, Deputy Prime Minister, on Tuesday 19 March 2019, to inaugurate the 21st Middle East Oil & Gas Show and Conference (MEOS 2019) in the Bahrain International Exhibition and Convention Center, organized by the Society of Petroleum Engineers (SPE), the Arab Exhibition Management Company and in cooperation with the National Oil and Gas Authority (NOGA) and supported by a number of regional and international oil companies. H.E. Shaikh Khalid bin Abdullah Al Khalifa expressed his sincere thanks and appreciation to H.R.H. the Prime Minister for patronizing this conference and the accompanying exhibition. H.E. conveyed the greetings of H.R.H. the Prime Minister to the organization and participants of the exhibition, and wished them success in contributing to the development of the oil and gas industries. H.E. Shaikh Khalid stressed that the oil industries sector is of great interest to the government under the leadership of H.R.H. the Prime Minister, who spares no effort in upgrading it and bringing it up to date with the latest international systems and maximizing its returns for the benefit of the national economy, pointing out the importance of this sector to the economic development. H.E. Shaikh Khalid said that the investment in the oil and gas industries is one of the most important bases for diversifying the investment and industrial base and opening up new horizons for the oil industry, maximizing the value added of its revenues, especially in the light of the savings and possibilities that the sector offers more jobs for the citizens. H.E. Shaikh Khalid had a tour in the exhibition, where he was briefed about the products that represent the latest modern technologies in the oil and gas industry, where he praised the excellent organization of the exhibition and the its good reputation that attracted major global companies and regional and international oil institutions to participate in it. In conclusion, H.E. Shaikh Khalid praised the efforts of MEOS organizers, wishing them every success and achieving more future ambitions aimed at developing the oil industries, noting the importance of this global event, which gives a good opportunity to share experiences, information and successes, and this aims to develop the oil industries. On the other hand, H.E. Shaikh Mohammed bin Khalifa Al Khalifa, Minister of Oil, warmly thanked H.E. Shaikh Khalid bin Abdullah Al Khalifa, Deputy Prime Minister, for the opening of the exhibition accompanying the conference, which is one of the largest events in the Middle East, with a numerical participation of officials in various international oil companies. H.E. the Minister of Oil said that despite the current challenges and fluctuations in oil prices at the global level, investment in the oil industry is still promising and continues to evolve. Noting H.E., the Kingdom of Bahrain's keenness to develop the oil industry to enhance its ability to achieve returns that contribute in promoting the national economy. The exhibition was attended by over 200 exhibitors from various international oil companies from 25 countries such as Australia, Canada, China, Brazil, Denmark, Kingdom of Saudi Arabia, Kuwait, USA, Turkey, Russia, Malaysia and other countries of the world who showcased the latest findings of modern technologies in this important field.